Video surveillance cameras are now being installed almost everywhere, so why not in your homeowners association (HOA)? When used properly surveillance cameras can provide additional security, a greater sense of safety and a deterrent to would be criminals. Yet several questions and considerations are often raised with respect to the installation of surveillance cameras within a HOA. Does it violate the law for a HOA to install surveillance cameras within the community? Are these cameras helpful in reducing criminal activity? Is it acceptable to use “dummy” cameras instead of operative cameras? Does a HOA have to post signs notifying the homeowners that they are under video surveillance? These are some of the questions that HOAs are asking legal counsel as their Boards consider installing surveillance cameras to monitor entry gates, parking facilities and other common areas. This blog post will address some of these questions while providing your HOA and management personnel with some guidance in this area. This information can also be found in our new resource entitled “Surveillance Cameras within your Association”, available for download from our library. 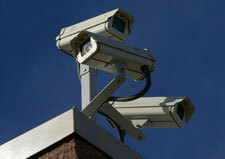 Is it Legal for a HOA to Install Video Surveillance Cameras? Currently it is legal to install these cameras in all areas except in those where homeowners may have a reasonable expectation of privacy, such as locker rooms, bathrooms, or areas where the camera may record the interior portions of a homeowner’s unit. The most popular locations to install surveillance cameras are at entry gates, recreational facilities and other common areas as a means to deter trespassing, vandalism, property damage, and rules violations. Are surveillance cameras helpful in reducing criminal activity? Studies on the effectiveness of surveillance cameras suggest that they are indeed effective at reducing the number of low-level crimes such as automobile break-ins and burglaries in areas where cameras have been installed. This is a major reason why some HOAs, especially condominium complexes, opt to install surveillance cameras in common area parking facilities. Surveillance cameras have also proved immensely helpful in prosecuting individuals caught in the act of committing a crime or in enforcing violations of a HOA’s governing documents. It is important to note, however, that these cameras are only effective if they are regularly maintained to ensure proper operation. Is it Acceptable to Use “Dummy” or Inoperable Surveillance Cameras? “Dummy” cameras are not recommended because they may provide a false sense of security to homeowners who believe that the area is being monitored for security purposes. HOAs should refrain from using dummy cameras in lieu of, or in addition to, operable surveillance cameras. HOAs should ensure that every surveillance camera used is capable of recording onto videotape, a DVR, or other medium that can be easily stored and later referenced. Broken or inoperable cameras may be viewed as dummy cameras; surveillance cameras should thus be maintained in operable conditions at all times. Must a HOA Post Signs Notifying the Homeowners that Surveillance Cameras are in Use? There is no law requiring HOAs to post signs informing homeowners that they are being filmed with surveillance cameras. However, the posting of signs informing homeowners and other persons that the area is under surveillance may help to increase the cameras’ deterrent effects. In summary, surveillance cameras can be an effective tool in deterring criminal activity and rules violations in HOA common areas. HOAs wishing to install surveillance cameras should ensure (1) that surveillance cameras are not installed in areas where homeowners may have a reasonable expectation of privacy, (2) that all surveillance cameras are operable at all times and are capable of recording onto a medium which can be easily stored and later referenced, and (3) that Dummy or otherwise inoperable cameras are avoided at all times in order to prevent creating a false sense of security for homeowners.